​Remember Lizzy, Lexie, Moscow, Summer and Dili? The siblings were all part of a Stray Management Programme we are conducting at a site at the far end of Singapore. We planned to sterilise them and return them to the area. They were so sweet so we decided to keep them all and find them homes to call their own. After much hard work and time, the siblings have all found beautiful families and homes to call their own. Life on the streets was tough but they are now all precious members of their own families. Here's the entire family at a recent gathering. Thank you all for adopting and giving these lucky pooches a home away from our cold hard streets! Why ADOPT? Watch this video to find out more! Featured here are Ursula and Ella who adopted Ringo from us. Ringo was stricken with heart worm and had spent all her life on the streets. The Burton family decided to open their hearts to fostering Ringo and they eventually chose to ADOPT her! This video is part of a series that shares a little bit about what volunteering, fostering and adopting entails! A special thanks to the students from Team Treasure Em Dogs who are doing a degree in Communications at the University of Buffalo, The State of New York who kindly put the videos together! Whiskey was rescued as a puppy and rehomed 5 years ago. Sadly, his owners are leaving the country and for their own reasons unable to take Whiskey with them. We do not want to judge or pass negative comments though we are saddened the only family Whiskey has known since he was 2 months old is leaving him behind. Whiskey is 5 years young, healthy, vaccinated, micro chipped and sterilized. Whiskey is 100% grass trained and requires two short walks a day for this. He will not make a mess indoors. Whiskey is HDB approved. Whiskey is nervous on leash but gets better with shorter walks also once he trusts his handler. He is great with dogs and loves play. Whiskey is also good with people. He is shy and does not always warm up instantly to men but adores ladies and falls for men within a day. Whiskey has lived in an apartment setting all his life so he would be perfect in an apartment. For just $10 a month, you can help us fill the bellies of 1000 dogs and 250 cats. We have created food bundles that consist of Kibble and Canned food for the five shelter beneficiaries of CAS food drives. The seven shelter beneficiaries are Doggie Rescue Shelter, Exclusively Mongrels, Gentle Paws, Just Kindness, Oasis Second Chance Animal Shelter (OSCAS), Uncle Khoe's, K9 Missions, Block 2 Furever Canines, CAS Adoption Centre, CAS Street animals and other Independent dog and cat feeders. Do also check out how pet food companies are helping us to feed street and shelter animals......refer to External Raisers below. We also have wonderful partners with seasonal offers that benefit CAS! Do check out our Facebook for these festive events. Animal lovers & animal loving businesses are looking to do their part for our street and shelter animals! ​Buy a pair of earrings from the Floral Side (thefloralside.com) and $1 goes to CAS! AHA is offering attractively priced dog food items as donations to CAS. With every 2 bags of Wellness Dog food purchased in a single order, ShopYbf will donate additional 1 bag to CAS. Beary is offering attractively priced dog food items as donations to CAS. helps raise funds for 9 animal rescue groups in Singapore including CAS! Like them on Facebook for more news. Grab a copy of The Three Muttsketeers! Our CAS Education programme aims to help organisations and individuals in our community understand Animal Welfare issues in Singapore and learn animals related skills. Education is fundamental to helping raise awareness for the plight of animals in Singapore. The more you know the more power you have to be the change. Email volunteer@causesforanimals.com for a chat! ​We recently had a group of special visitors from ​North Vista Secondary School who kindly ran a fund raiser and awareness campaign in their school as part of their VIA (Values in Acttion) Project. The students also attended a tour to find out more about the work we do at CAS as well as the animals we care for. The students also left their mark by sponsoring a kennel in aid of the animals at CAS to help us continue our rescue and rehoming efforts. 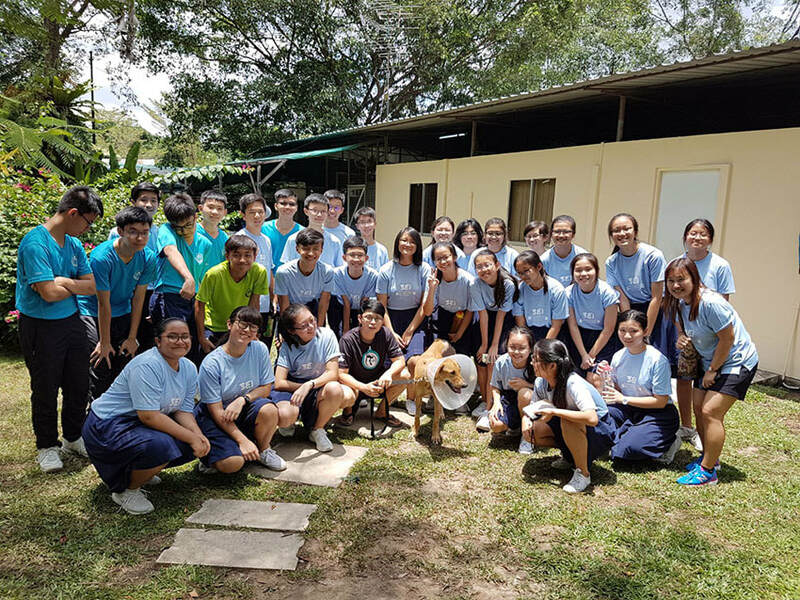 A Special Thank You to 3E1 as well as their form teachers for their effort and time to help street dogs and cats in Singapore via their efforts! A special thanks to the folks from Citi Bank for supporting CAS efforts to help street and shelter animals in Singapore! The folks from Citi Bank schedule their staff on a rotational basis to help us with dog walking, cleaning and feeding on Fridays as part of their Corporate Social Responsibility Programe. A special thank you to Citi Bank for helping us help animals in need! A Special Thank You to the kids from Dover Court International School for their generous support ! The students had attended a talk by CAS on Animal Welfare and caring for street and shelter animals. They were moved by the plight of our street animals and decided to run an Art Auction featuring their own paintings! The students painted CAS residents and all paintings put up for sale were snapped up! They managed to raise an astounding amount of $1742.12! Thank you for supporting street and shelter animals and helping us help animals in need! The boys from Saint Joseph's Institution were amazing and helped at the CAS Adoption Centre for two weeks! Their task included dog walking and cleaning of the facility. To top it all of, the teams from SJI also did a mini showcase of the work we do and how we can all do out part to help street and shelter animals! Thank you boys for helping us help animals in need! We would like to say a huge thank you to the wonderful students from North Vista Secondary School who organised a merchandise sale as well as chocolate sale in school to raise funds for CAS street and shelter animals! The students were also eager to see how their donations would be put to good use so they joined us for a tour of the facility with their teachers. We would like to thank the students of 4E2 for helping street and shelter animals as part of their Values in Action Project! If you are looking to run a VIA project in your school and enjoy a tour of our facility, Email info@causesforanimals.com for a chat! We would like to thank the wonderful folks from Air BNB for organising a corporate volunteer trip to CAS Adoption Centre as part of their Corporate Social Responsibility Project! The doggies loved the cuddles and kisses the team had to offer and they were awesome with helping us keep the facility spick and span. If your company is looking to help CAS via an onsite trip as well as a fundraiser, we would be happy to share our ideas with you or learn more about what you have in mind! We have been made aware that there are scammers impersonating as our volunteers and asking for donations. Please note that CAS does not solicit funds through telemarketing or door-to-doo fundraising campaigns. Please do not donate. If you are ever approached in a public area from a person purporting to be a CAS volunteer, please first ask to see his/her NRIC and a copy of the collector’s Certificate of Authority issued by the Singapore Police Force. 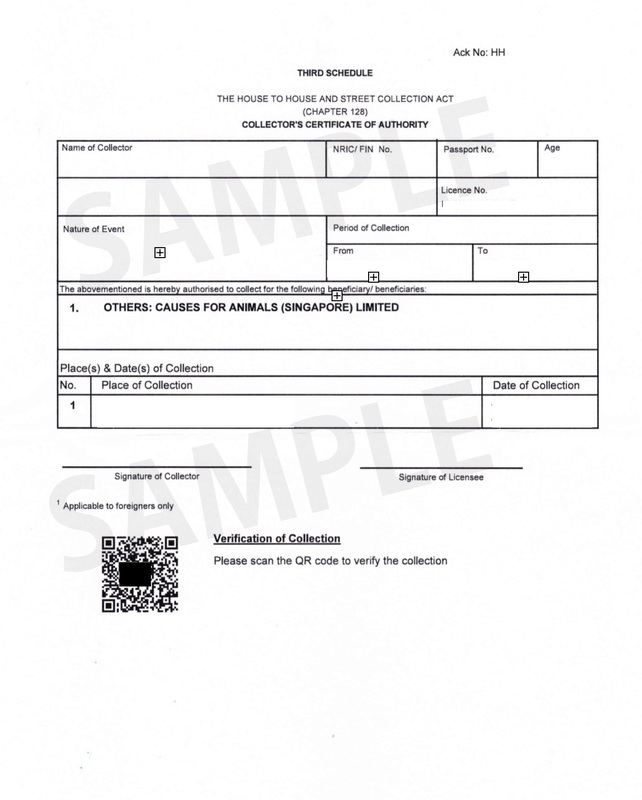 A sample COA is attached. Click here to read more about recent medical cases and their road to recovery. Change can start with YOU! Together, we can speak up against puppy mills! Joshua our rescued street puppy has found a forever home.... and he has something to share! Have you wondered what the mummy behind the cute puppy at the breeders looks like? Have you wondered what happens to the dogs that have been bred and eventually can no longer reproduce? 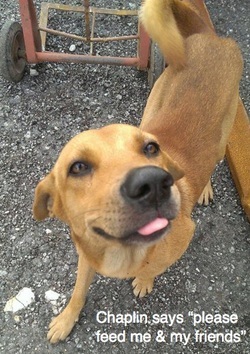 Many are dumped cruelly on the streets or simply euthanized when they no longer serve their purpose. We have young, old, middle aged dogs for adoption! We have HDB approved local dogs and more. Don't shop for a pet, ADOPT! CAS wishes to thank all individuals & big-hearted corporate donors/sponsors who have a soft spot for animals in need.